From being able to grab exact colors to generating color codes, a good color picker is essential for Web or app development. Hues 1.1 (Mac App Store link) is one of the many Mac color picker apps available, and while you can pick colors fairly easily, the app has plenty of room for improvement. Generally, color picker app stay in the menu bar and out of the way. However Hues prefers to be an app that crowds your dock, without even so much as the option for a displaying a menu bar icon at all. Hues’ history feature is fairly useless, since “history” in this case means any color you’ve ever selected, even on the color wheel, sliders, or elsewhere. Simply adjusting a RGB slider will erase any useful history you may have had, and replace it with a gradient of colors you were sliding across. 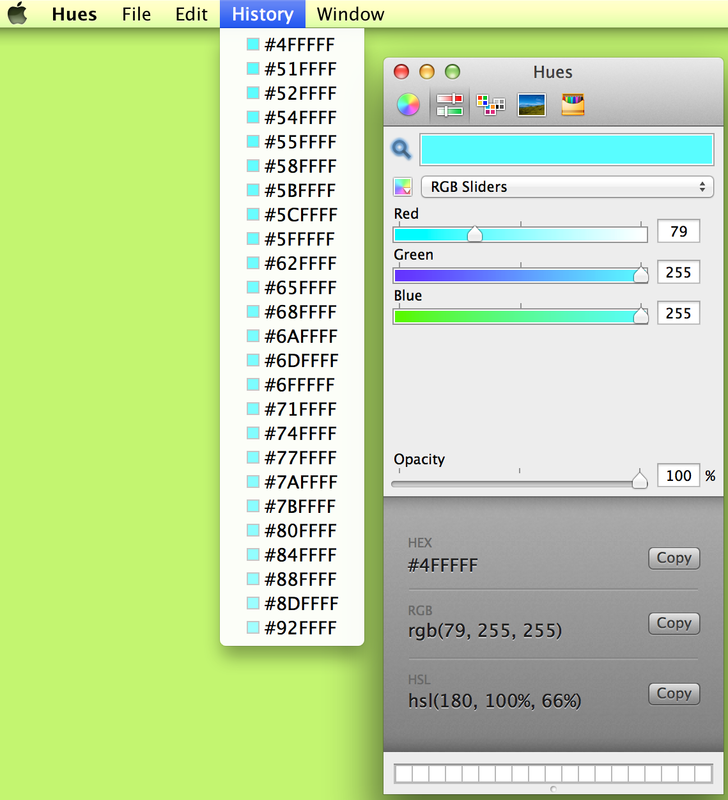 Hues' history would be more useful if it could organize the colors based on which color picker you used. Another problem is that the magnifying glass used to select your color is awfully small, which makes it difficult to find the exact color you’re trying to select. Other color pickers like Sip and Frank DeLoupe have bigger magnifying glasses, which make selecting the pixel you were aiming for much easier. To its credit, Hues does offer a fairly comprehensive method of outputting the color code of your choosing, and lets you format them however you like. There are dozens of color picker options out there, and with limited options and no hotkeys, Hues does little to separate itself. 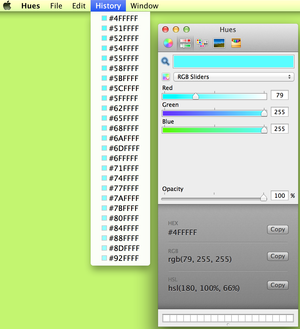 Hues is a basic color-picker app.